Hola, kitties! 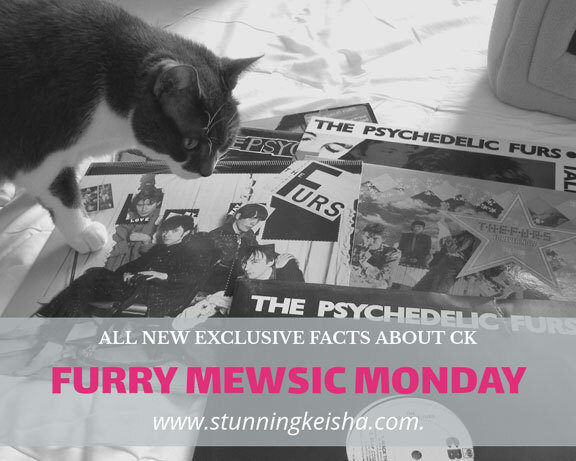 For today's Music/Mewsic Monday, I decided to do something different. It's a freebie week so I'm free to choose whatever theme I'd like. Tell you what—I haven't done any of those "learn about CK" memes of late so I'm gonna combine them both in this one post. This musical meme was shared by Lone Star Cats' human about two weeks ago on Facebook. I hope you'll find it fun and want to try it yourself. Cats do like music after all so play these tunes LOUD but not so loud you'll hurt kitties' ears. The rules for this pawsome game go like this: using only song titles from one artist/band cleverly answer the questions. It's not as easy as you think. After considering a bunch of bands, I decided to go with the P. Furs cos, well duh, FUR. You may want to try this—I hope you do!—or you may want to let your human play or you could describe your human. Using P Furs songs, I might have described TW as Susan Strange. HAH! It's not as easy as you think. Have fun and play along cos I'd love to see/hear what you come up with. Seriously, you don't even have to link up all the songs like I did. 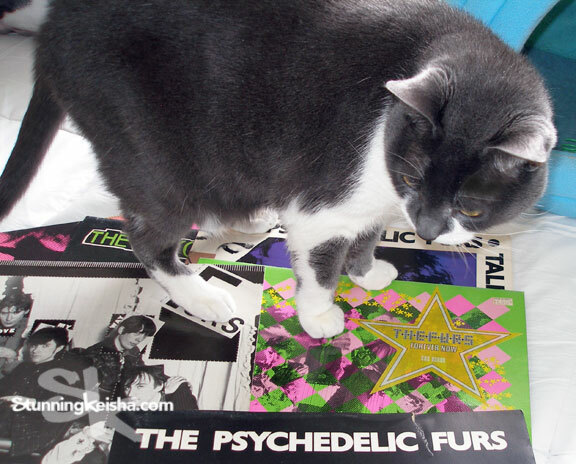 You can learn a lot about a cat by the type of music their peeps listen to. I'm joining the Music Moves Me blog hop hosted by Curious as a Cathy and XMas Dolly and a chorus of others. Next week is an easy theme: Earth Day. My human has tried doing this song meme, but so far she hasn't been happy with any of the bands she likes. Imitation of Christ, MOL MOL! Wow, that seems very hard to do! But of course, you pulled it off. MOL, your TV show! Oh what fun! I did Q&A like this last year I think and you're right it's not easy. I may have to borrow from this idea to use in a future post. That being said, I am going to bookmark this post to remind me to give it stab after the A2Z Challenge passes. Whenever you get a chance stop in to boogie with me in today's hodgepodge of 4M, Sparks, A2Z, & BoTB. Have a tunetastic week, my friend! You are so clever. It was a fun game and your answers are pawsome! The autographed cover is pretty cool! I think coffee is TW's best friend too. MOL! Great challenge. I've thought of doing something like this in the past, but you are right - It is HARD! Maybe one day I'll do it. Not sure what's goin' on here, but as far as your mewsic choice... very cool. Thanks for the introduction to this tune. You have definitely rocked the house! Thanks for stopping by! CK...this waz knot eazee !!!!!!! What fun! We LOVE your answers, and duh . . . FUR! Awesome! Ooh that's a tricky one deserving of much thought! Dang it all. I knew I would forget so I listed my but the comment disappeared CK. Oh well, yours were terrific. Thanks for the memories, Cathy and Keisha! 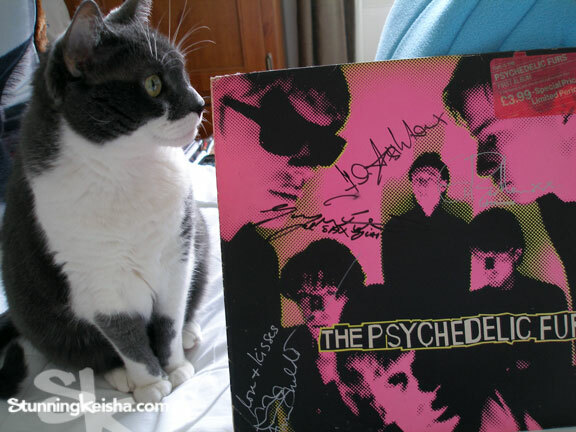 I absolutely love The Psychedelic Furs. Pretty In Pink is awesome, but I was more a fan of their later stuff. Especially Heartbreak Beat. This album takes me back, for sure! So we kitties let Mom try this. Gosh...CK if Mom were not in a rush to get back to work, we would enter our songs! At least I got her to try to catch up on commenting. 3 weeks until the final final rollout, 10 hours a day and 1 day each weekend! Very creative answers. I guess this wouldn't work with a band that was a one-hit wonder!